No one can deny the rights of Suaram as a organization that fights for human rights, to file a complaint on the transaction process of the Scorpene submarines made by the Malaysian Government to the court of France. What can be questioned is that what are their motives to raise an issue of our country to be judged by a foreign country. It gets worse as now, Suaram is no longer seen as a free organization which fights for justice. Instead, they are going overboard. Suaram is not satisfied with its functions as a complainer, they want to be the prosecutor and judge of the issue instead. Suaram even stated that the Prime Minister will be given subpoena by the court of France to provide statements in the bribery trial. It seems like their court have not even came to any result from their investigation, Suaram had known the results sooner they they do. When Suaram did so, obviously rakyat would think on what are the purpose of bringing up the issue? More importantly, who ordered them to do such thing? Suaram is fighting for who – rakyat? the opposition? or even worse, foreign power? Suaram uses the service of two French lawyers to help them in the Scorpene issue, Joseph Breham and a famous human rights lawyer, William Bourdon. William Bourdon is the founder of an organization that is known as Sherpa where they fight for the imbalanced economy issues in poor countries such as Africa. Sherpa is funded by two international organizations, both with big funds, Open Society Foundations (previously known as Open Society Institute) and Tides Foundation. OSF is fully funded by the currency criminal, George Soros who almost destroyed Malaysia’s economy back then in the economic crisis in 1997/1998. That was when Opposition Leader, Anwar Ibrahim who was the Finance Minister, wanted to give up Malaysia’s dignity to the International Monetary Fund (IMF), before he was stopped by former Prime Minister, Tun Dr Mahathir Mohamad. OSK is one of the biggest funder to the Tides Foundation, funder of Sherpa. Tides Foundation did provide fund for Suaram, USD15,000 to organize its activity a few years back. According to its website, Tides Foundation is an international organization that supports the left-wing agendas. And because Suaram is seen as an organization that fights for left-wing understanding such as socialism, that is why they received such grant from Tides Foundation. Few of the agendas fought by Tides Foundation include “radical gay, lesbian, bisexual, and transgender advocacy (LBGT)”. 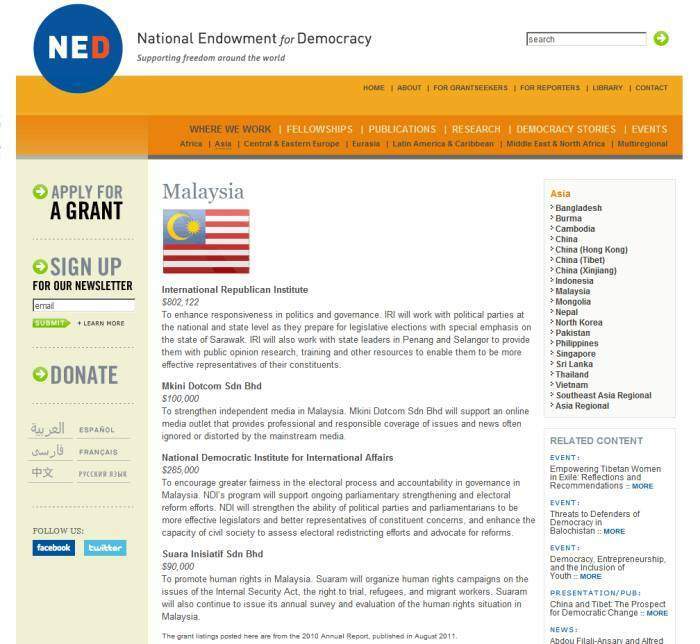 So, it is not surprising when Bersih’s Chairman, Ambiga Sreenevasen admitted that Bersih received financial aid from two American Organizations, National Democratic Institute (NDI) and OSF. Ambiga is the backbone of the annual Seksualiti Merdeka program which is held to promote LGBT lifestyle in this country. The Bersih assembly, which was organized to bring down the government were clearly supported by Opposition Leader, Anwar. 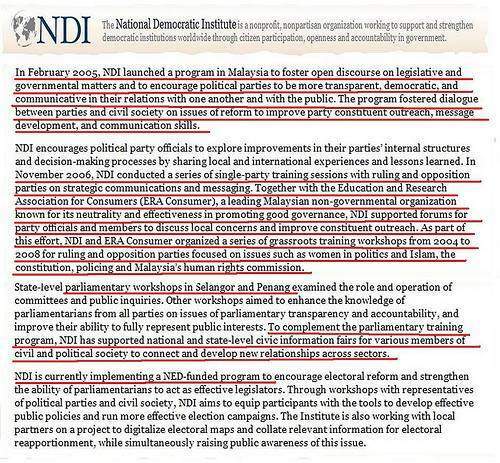 Back in 2007, Anwar became one of the panels in the fund-raising event organized by National Endowment for Democracy (NED), an organization that also funds NDI. If we are to look at this in detail, the involvement of Suaram in Scorpene issue, Ambiga in Bersih and Anwar as the opposition leader often relate to one another. Suaram’s actions in bringing up the issue of Scorpene to France court is not a coincidence and Bersih 3.0 rally on April 28 is actually planned. The main backbone behind all this would be Anwar Ibrahim and his bosses, international Zionists – Jews organizations. Suaram’s submarine a PKR torpedo? Dari Mana Phonm Penh Post Ini Datang? Scorpene: Najib Minta RM3.8 Billion Rasuah? Scorpene: Najib Asked For RM3.8 Billion In Bribe? Where Did Phonm Penh Post Come From? THERE ARE NO TRIAL ABOUT SCORPENE IN FRANCE! Submarines: Who Is Funding SUARAM To Lie? Kapal Selam: Siapa Biaya SUARAM Untuk Menipu? Scorpene Issue – Where’s The Beef? Potong Steam lah!